We suddenly have snow again in western Massachusetts, making it easy to spot all the antifreeze-filled bugs that have been actively wandering around on the ground all winter. I haven’t had a chance to go for a walk in the woods yet, but walking up my unplowed driveway this afternoon, I passed a lauxaniid fly (Sapromyza brachysoma), at least two different kinds of midges (Chironomidae), and a small winter stonefly (Capniidae)–none of which inspired me to run in and dust off my camera. But then I met this snow scorpionfly (Boreidae: Boreus brumalis), which was too photogenic to pass up. …which makes me think maybe they normally live in trees, and the ones I see aimlessly wandering on the snow are just the ones that have been blown down. 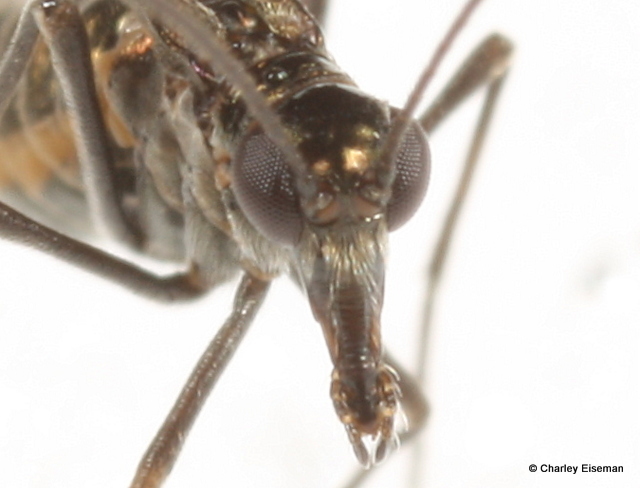 Snow scorpionflies have long snouts, like other members of the order Mecoptera, such as common scorpionflies (Panorpidae: Panorpa) and hangingflies (Bittacidae). I think they look a bit like dragons up close. As I already mentioned, snow scorpionflies are able to jump, which I don’t think is true of members of the other mecopteran families. Of course, most of the others have wings so they don’t need to jump. 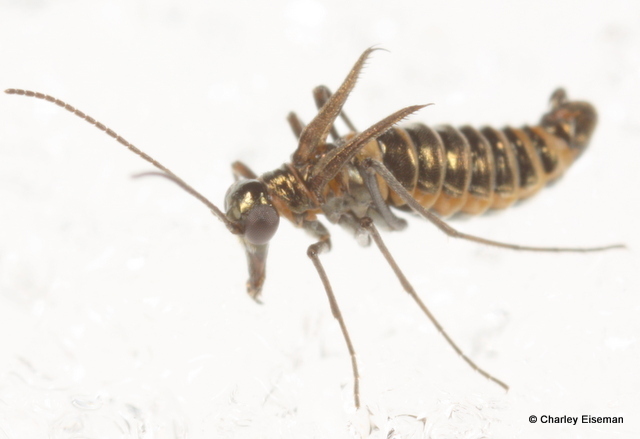 The going theory (based on various morphological and genetic evidence, not just the fact that they jump) is that snow scorpionflies are the closest relatives of fleas. 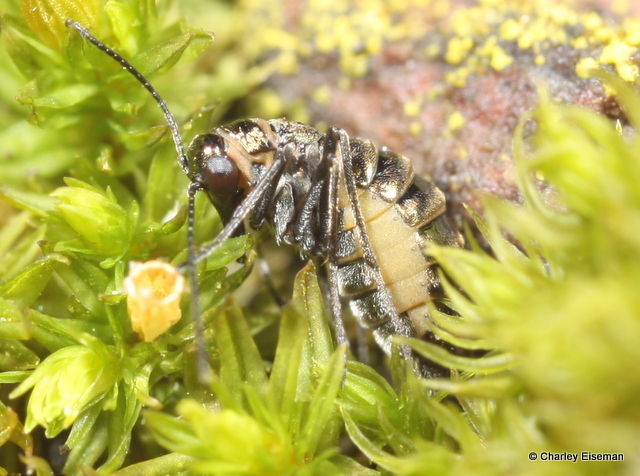 If this becomes more generally accepted, fleas would no longer get their own order (Siphonaptera) and would be classified as, I suppose, a family of scorpionflies. 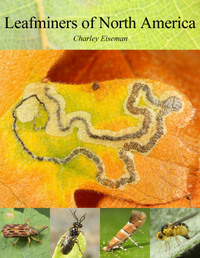 Just as termites have recently been determined to be a kind of cockroach. For a split second immediately before jumping, snow scorpionflies raise up their vestigial wings. My first dozen or so attempts at photographing this today yielded only pictures of snow, but eventually my reflexes got fast enough to capture it. 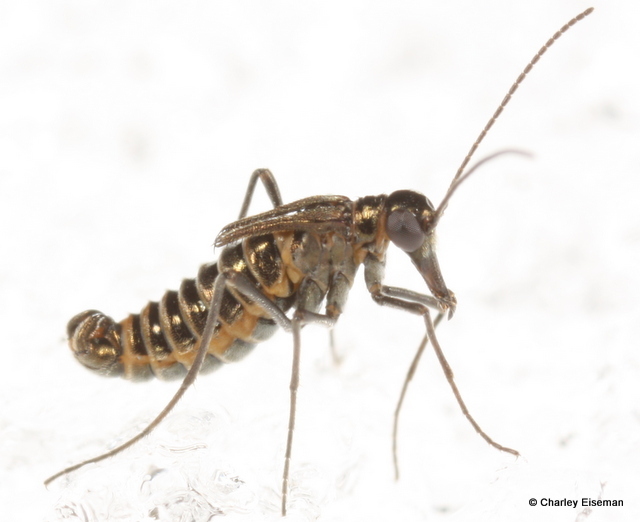 This entry was posted in Uncategorized and tagged Boreidae, Boreus brumalis, brachyptery, Mecoptera, scorpionfly, snow scorpionfly. Bookmark the permalink. There’s a paper in Nature (1 March 2012) this week with some ‘giant fossil fleas’ from the Jurassic and Cretaceous that are very mecopteranish, but have mouthparts more like fleas. These fossils are dorso-ventrally flattened, not compressed laterally, and lack the leg modifications of fleas – but interesting that boreids can jump with long skinny legs. Makes the author’s hypothesis of relationship seem less unlikely. Unfortunately, the paper is behind a pay wall, but if you google ‘giant fossil flea’ you can see the pictures and read all the unsupported fantasies about dinosaur fleas. Ah, how timely! One of the photos is here, and the actual paper is here. That first shot is great. Don’t know if they have these up in Alberta, but I’d love to have a chance to photograph one! 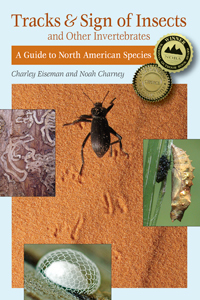 It looks like the genus occurs across Canada–see the distribution map for photos submitted to BugGuide. We’re in Northern Ontario and my two year old has been facintated by these guys. She loves spotting snow fleas but these are the big ones and aren’t nearly as numerous so it’s more of a challenge to find them.